Increasingly, US & global grain markets are gearing up for a new Northern Hemisphere growing season, and of course weather will be gaining in importance beyond the next 30 days or so. Really, amid recent and upcoming warmth, corn planting will kick off in parts of Texas and Louisiana by the end of February, but such early planting isn’t that unusual, and anyway production there doesn’t have a major impact on national prices. But in the near term, the primary fundamental indicator of prices will (still) be international prices, and how the US fits into the global market. The graphic above displays US Gulf corn’s discount (or premium) to feed wheat in Russia and Ukraine, the world’s second cheapest feedgrain. 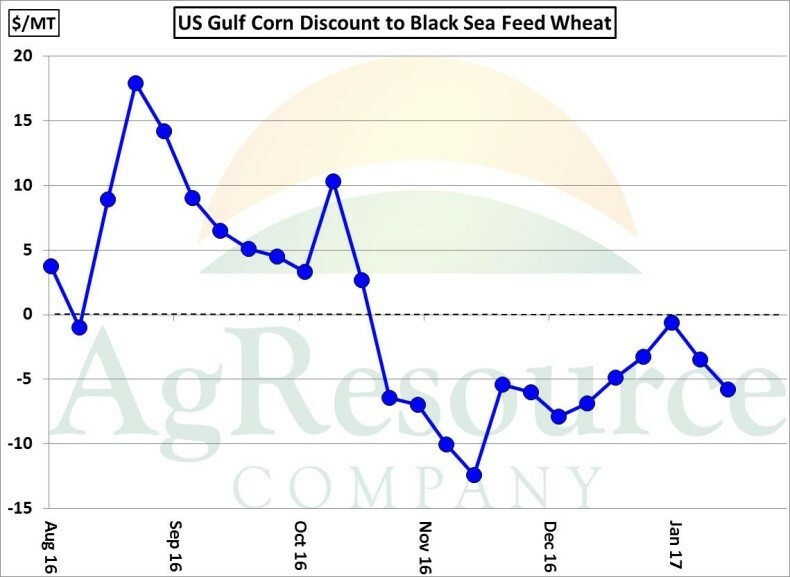 Notice that once Gulf corn reached parity with Black Sea feed wheat in mid-January, the market corrected. This is fair, as despite a record pace of ethanol production and ongoing export demand, the goal of the US corn market is still to encourage demand, rather than slow it – recall US corn ending stocks are estimated by the USDA at 2.4 billion bushels, and are very much likely to end the crop year at 2.2-2.4 billion despite record demand. 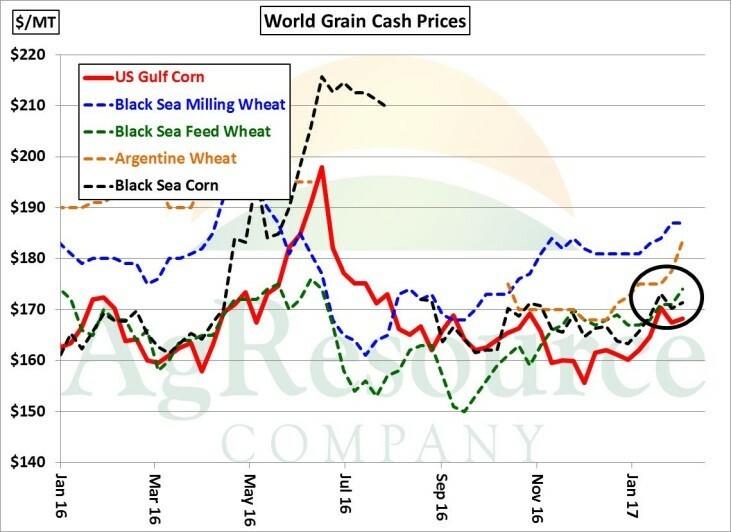 Notice in the graphic above, which displays wheat and corn cash prices from a host of major exporting countries, that Gulf corn is still very competitive, and will easily find additional export demand until South America’s corn crop is harvested this spring. But also notice that several grain origins lie just above Gulf corn, and so rallies will only find export competition, and thus are unlikely to be very lasting or meaningful. Since the goal of the market is to maintain record consumption, we view corn’s fair value in a range of $3.50-3.75, basis March. Within this range, solid export and biofuel demand will continue. Above this range, demand is slowed. As such, we don’t expect price to collapse in the near term, but we do encourage sales at the upper end of the range. Beyond March/April, it’s all about Central US weather, but even then we doubt the long-established price range in corn changes unless growing conditions are either very good or very bad.